Project 50 is my quest to visit all fifty states and document my visits thereto with photographs in front of each state's Capitol building and one of each state's welcome signs. I was walking down the street with my best friend in Boston in June 1999. We passed the Massachusetts Statehouse and for no particular reason, I said, "Hey V, take my picture. I'm going to take a picture of myself in front of all 50 state capitols." And thus Project 50 was launched. On the way home from Boston that weekend I visited the capitols in Providence and Hartford, and got photos of the signs in Rhode Island, Massachusetts, Connecticut, and New York. What's the point of this whole thing? It started on the spur of the moment and seemed like a cool thing to do. I like to take pictures and I like taking long road trips. And now that I'm 87% done, I can't jolly well stop now! Isn't this thing pretty stupid? Maybe. But you didn't think of it. My brother busted on me for a while for this. But then one day when he was drunk he admitted he thought it was cool. How come you're not smiling in a lot of the pictures? I actually never even realized that until I was showing my album to a friend when he pointed that out. Simply put, many of the pictures were taken by my cameras' self-timers. With no one else there, and looking at a camera on a tripod in front of a busy interstate or an empty streetcorner, I never even realized I wasn't smiling. So from that point forward I made a conscious effort to improve. One exception was the welcome sign in Arizona, which I took right after a truck in the right lane blew my new camera onto the pavement. I have used two Single-Lens Reflex 35mm cameras and one digital camera. My first SLR was a Minolta Maxxum 400si which I had until it was stolen in November 2001. My new SLR is a Nikon F90x, which is the export version of the N90s, with the MB-10 vertical grip and MF-26 databack. I actually bought both SLRs (and all five lenses I've had at one point or another) on eBay and had no complaints. My digital was a Christmas present in 2001 and it's a Fuji Finepix 2300. Beginning with the St. Louis trip in September 2005, my digital is now a Nikon D-70. I don't really use my F90 that much anymore. Sometimes you say "capitol" and sometimes "capital." Discuss. Capitol with an O means the building. Capital with an A means the city. What capitol was your favorite? My criteria for determining this were overall grandeur and stateliness, and the capitol grounds. To me a capitol should be a very large, beautiful, ornate building of classical Greco-Roman architecture, situated on a park with monuments. Given that, my favorite is probably West Virginia. I think the only thing they could have done differently in West Virginia was to put it in the heart of downtown. Just on the basis of grandeur alone, Minnesota and Pennsylvania were also impressive. And I'll give a sentimental nod to Maryland's 223-year-old statehouse. Here are some of my other favorites, in no particular order. Washington was very good, but the capitol was on one side of the grounds, not in the middle, with poor sightlines. I also liked Utah, Wisconsin, South Carolina, Georgia, Oklahoma, Texas, and Kentucky. Missouri, Mississippi, and Arkansas weren't bad either. And I still have 7 to go, too. What capitol was your least favorite? They were mostly in the small northeastern states: Delaware, Vermont, and New Hampshire. I also wasn't very impressed with North Carolina or New Jersey. How come you don't have any pictures of the inside of a capitol? Primarily because many of my capitol visits did not take place during business hours. That, and because I never really thought of it. I did finally start going inside the capitols during my Big Bear Lake Road Trip, during which I made it inside five of the seven that I visited then. After being inside the Utah and Wisconsin capitols, I wish I had made the decision to go inside them much sooner. You sure wrote a lot. Yes, I did. There are currently 74 different essays here of varying lengths; one for each of the 73 photos taken thus far plus one that I did for Wisconsin anyway. During a very productive procrastination session I pasted them all into a Word document: together they total almost 30,000 words. That's almost half a book. Unfortunately some of the essays were written months or even years after the pictures were taken. Some had to be rewritten after jimpoz.com went kablooey a few years ago. Can you name all 50 states without looking? Maine, New Hampshire, Vermont, Rhode Island, Massachusetts, Connecticut, New York, New Jersey, Pennsylvania, Delaware, Maryland, Virginia, West Virginia, North Carolina, South Carolina, Georgia, Florida, Alabama, Mississippi, Louisiana, Ohio, Indiana, Illinois, Michigan, Kentucky, Tennessee, Arkansas, Missouri, Iowa, Minnesota, Wisconsin, North Dakota, South Dakota, Nebraska, Kansas, Texas, Oklahoma, Utah, Idaho, Washington, Montana, Wyoming, Colorado, New Mexico, Arizona, Oregon, California, Alaska, Hawaii, and Nevada. I was also able to draw this, freehand, without looking. What can I say. Ever encounter any unusual events at a capitol? I was in Austin TX and Tallahassee FL during the Bush-Gore recounts; Frankfort KY the day before the Kentucky Derby; and a deserted Montpelier VT at 9 am on January 1, 2000. I also saw a bunch of abortion protesters (don't remember which side they were on) having a vigil right around the 29th anniversary of Roe v. Wade adjacent to the capitol grounds in Phoenix AZ. In Jefferson City MO I saw Governor Blunt announcing a new college savings program. I also was at the U.S. Capitol in February 1999 during the impeachment (I even got to watch about a half hour of the impeachment in the Senate Gallery). Lots of protesters outside, and I even got to shake hands with Sen. Strom Thurmond. What was the farthest you drove just to get a picture? When driving back to New Jersey from Dallas TX, I visited the capitols in Texas, Louisiana, Mississippi, and Alabama. Because of the Bush-Gore saga, I figured that I might as well drive to from Montgomery AL to Atlanta GA via Tallahassee. Otherwise, I probably would not have. So that was an extra 250 or so miles. Of course the itineraries both there and back included several state capitols and state lines, and neither was devised with ruthless efficiency in mind. When I went to Phoenix on business, I drove to the California line and back just to get my pictures before I even checked into my hotel. So there's another 325 miles. Ditto Jefferson City when I was in St. Louis, which was about a 270-mile round trip. I don't know. Of course Hawaii will be tricky. Hopefully I will not complete the Project in Hawaii, since anyone who has come before me likely has finished theirs there, so I assume the novelty of something like this coming to a conclusion in the Aloha State has worn off as far as Hawaiians are concerned. I figure that if I finish it somewhere like Idaho I might get some more publicity that way. 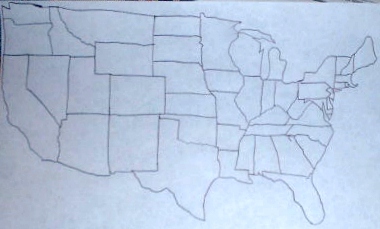 The most recent states I added were Colorado, New Mexico, South Dakota, Utah, Wisconsin, and Wyoming (sign and capitol); Iowa (capitol); and Minnesota (sign) in August 2008. This was my first update since September 2005. As of August 2008, I have nothing planned. Where was it you said you lived again? Are you going to redo any of the pictures? Eventually I'd like to retake some of the pictures that either didn't come out well or that were taken at night, such as those for Alabama, Arkansas, Delaware, Massachusetts, Maine, and Rhode Island. You talk about the architecture of capitols a lot. Are you an architecture expert? No, far from it. I'm sure those who are architecture experts, either historians or actual architects, are reading parts of the site pulling their hair out screaming, "No, you fool!" Since this site is about state lines and state capitols, which state capitols are closest to a state line? The New Jersey State Capitol in Trenton is 500 yards from Pennsylvania at the border in the middle of the Delaware River (and 650 yards from terra firma). The Rhode Island State Capitol in Providence is 3.5 miles from Massachusetts. The Wyoming State Capitol in Cheyenne is 9.7 miles from Colorado. The Delaware State Capitol in Dover is 12.3 miles from Maryland. The Delaware State Capitol in Dover is 12.4 miles from New Jersey at the border in the middle of Delaware Bay (and 15.5 miles from terra firma). The Nevada State Capitol in Carson City is 12.7 miles from California at the border in the middle of Lake Tahoe (and 13.6 miles from terra firma). The Hawaii State Capitol in Honolulu is (presumably) somewhere between 13 and 20 miles from international waters. The Minnesota State Capitol in St. Paul is 16.9 miles from Wisconsin. The Florida State Capitol in Tallahassee is 17 miles from Georgia. The Connecticut State Capitol in Hartford is 17.1 miles from Massachuetts. The New York State Capitol in Albany is 22.5 miles from Massachuetts. The Maryland State Capitol in Annapolis is 23.3 miles from the District of Columbia. The New York State Capitol in Albany is 25.3 miles from Vermont. The Vermont State Capitol in Montpelier is 26.1 miles from New Hampshire. Honorable Mention: The Alaska State Capitol in Juneau is 33.1 miles from British Columbia, Canada. The Missouri State Capitol in Jefferson City is 100 miles from Illinois. The South Dakota State Capitol in Pierre is 109 miles from North Dakota. The Montana State Capitol in Helena is 111 miles from Idaho. The Arizona State Capitol in Phoenix is 141 miles from California. The Texas State Capitol in Austin is 238 miles from Louisiana. Honorable Mention: The Alaska State Capitol in Juneau is 786 miles from Washington at the British Columbia border in the middle of the Strait of Georgia (and 800 miles from terra firma). Honorable Mention: The Hawaii State Capitol in Honolulu is 2,253 miles from Alaska (in the Aleutian Islands) and 2,360 miles from California (but only 1,324 miles from Kiribati and 2,243 miles from the Republic of the Marshall Islands). This page loaded in 0.849 milliseconds.